It's one of France's greatest exports next to baguettes, Godard movies and Thierry Henry. On an ethereal night hundreds of people dressed elegantly in white, converged at a secret location, shrouded in mystery, setting up miles of white fold-up tables draped in white crisp linens and topped with sparkling crystal soon to be filled with local wines. White plates and silverware were set, table decorations arranged from candles to candelabras. 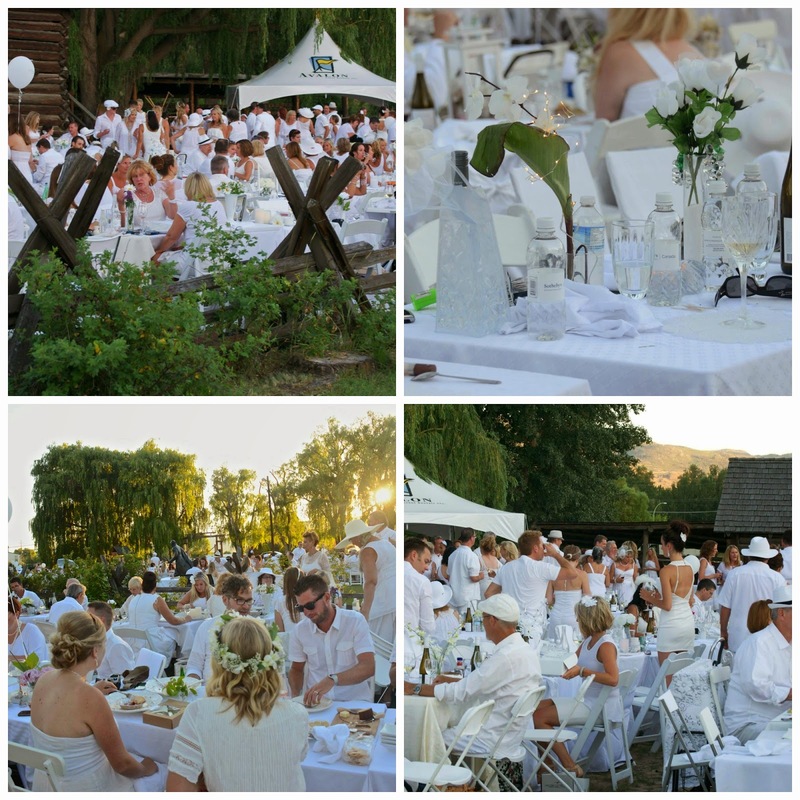 Our senses were heightened and we were more than ready for a highly anticipated evening at Diner en Blanc - Okanagan. The stage was set, candles flickered and nature and history created the backdrop, a kaleidoscope show of colour in the fading light as a sea of white revellers loomed before us. We waved our napkins in the air collectively, the sound of popping sparkling wines echoed all around, and there was a collective sigh of relief. All the planning, all the waiting has ended. We are all here for one purpose. We love food. We love celebration. We love the mystery. We mingle, we dine, we entertain with 850 of our "closest friends." With the historical site of the Father Pandosy Mission as our muse, a welcoming breeze on a sultry evening, and a wonderful view of the surrounding mountains, it seemed even the sunset and the moon cooperated. More champagne led to dancing... and as a friend said, "Non, je ne regrette rien..." I regret nothing. The original founder meant for this unique event to feel like a dream—the dinner party pops up in the middle of a public place and then disappears without a trace...like magic. Despite our cumbersome arrival by a fleet of school buses with fold up table, and picnic baskets in tow, the 850 pre-registered guests strove for elegance to emulate the original Parisian diners who launched Dîner en Blanc 25+ years ago. My white "granny cart" made quick work of carrying my gear with chairs supplied and on location from Avalon Rentals. Fascinators, white masks and wigs, jaunty hats and even 18th century style clothing were all "over the top" expressions of our 'tres chiche' individuality. No two were dressed alike. 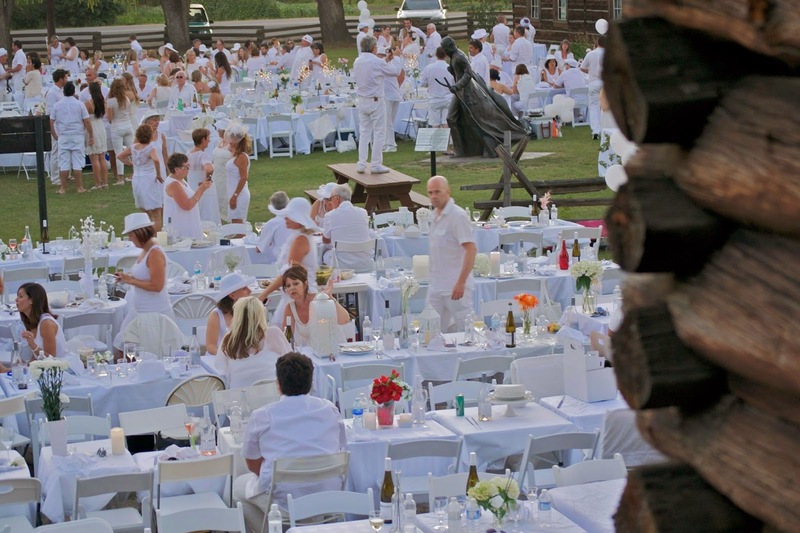 We were all in high spirits for the second sanctioned Dîner en Blanc in the Okanagan Valley. 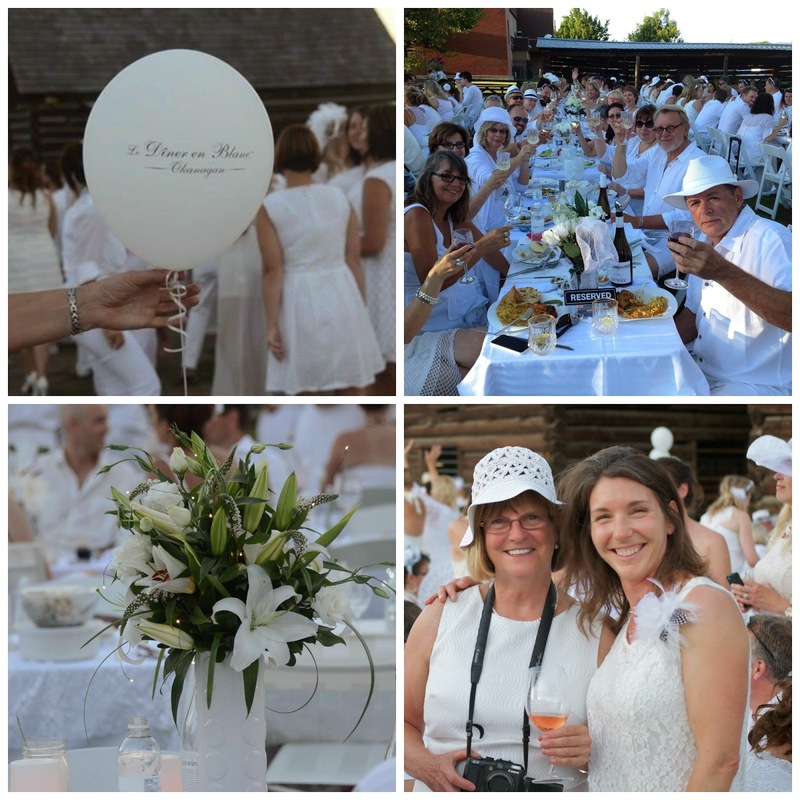 From global phenomenon to highly sought after “secret,” Dîner en Blanc took over Father Pandosy's Mission in East Kelowna on July 10, 2014. This très chic picnic, imported from France, is equal parts mystery tour, pop-up feast and 'je ne sais quoi.' It could be described as the flash mob of the culinary world. We came, we saw, we ate, we conquered! I love the whole concept!! Although Dîner en Blanc may be a 'pop-up' picnic, plaid napkins and fried chicken are nowhere in sight! Picnic baskets are packed with elegant white linens, white china dishes, real silverware and amazing food. Guests are requested to pack a 3-course meal which was limited only by our imaginations. At the table my friend Dina of Olive Oil and Lemons, her husband George (who as Laura put it brought wit, charm, and two strong arms to carry our picnic supplies. Thank you George!!!! ), and my friend Laura of The Culinary Travel Guide. We dreamed up a feast with portability in mind. I tagged along with summer-on-the plate individual Galette aux Fromage Chevre et aux Tomates (Chevre Goat Cheese and Tomato Tarts) (recipe below) and a Tossed Multicoloured Spinach Salad with Edible flowers from Old Meadows Farms. Dina brought along a super-moist Grilled Chicken with a Fresh Market Tomato and Basil Accompaniment, Parsley Pesto New Potato and Green Bean Salad and an array of local cheeses, Laura regaled us with a Puglian Barley Salad with Pecorino Cheese, ending with a well balanced Eton Mess as well as Butter Cookies from Sandrines for dessert. Dina served coffee, in a white carafe of course. Our tastebuds danced across the table with every culinary masterpiece placed before us as we enjoyed a leisurely pace of great food and excellent company as we got to know our neighbours. True to tradition, bystanders and passersby witnessed our group of revellers gathering at specific rallying points all across the city. We were there to see and be seen. Our individual groups then converged on one of the most beautiful settings in the city one by one to set up their tables and encroutements en masse. The logistics of organizing 850 people is mind blowing in itself. How they manage to organize 1,000's in larger cities is mind blowing. Paris hosts over 10,000 participants each year. We surveyed the scene with awe as it unfolded around us as we sipped wines brought in from Haywire Winery in Summerland. The Okanagan event was held in Kelowna which is the smallest of the cities worldwide but with our background of award winning wines and a reputation as a culinary destination, it seems only natural for us to be part of this unique experience. 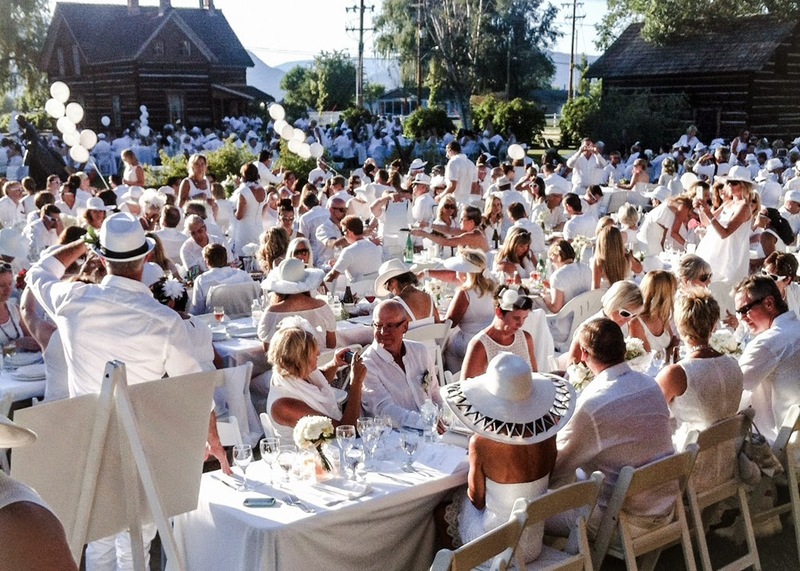 Spatula Media + Communications and Impact Events negotiated official status for Dîner en Blanc Okanagan last year. With this official status we join some of the most glamorous cities around the world including Paris, Milan, Barcelona, San Francisco, Chicago and Sidney. The Okanagan joins only eight other cities granted status in Canada to date... Montreal, Calgary Quebec City, Vancouver, Victoria, Edmundston, Niagara-on-the-Lake, and Toronto. There are other non-sanctioned white dinners around the world and I even read about a Diner en Noir in San Francisco. How did this yearly worldwide event start you ask? Dîner en Blanc is a magical experience that began in perhaps the chi-chest city in the world...Paris. It is a celebration of old-world elegance that Jay Gatsby would have adored. In the summer of 1988, Francois Pasquier had just returned to Paris after a few years abroad and held a dinner party to reconnect with friends. So many wished to attend that he asked them to convene at Bois de Boulogne dressed in white, so they would be recognizable to one another. Each attendee was also asked to bring a friend. The evening was such a hit that guests wanted more friends to join-in the following year and thus was born the concept of Dîner en Blanc. Dîner en Blanc now brings together over 10,000 people each year in some of the most prestigious locations throughout the French capital. In June 1991, four years after the event’s debut, the founding group of friends decided to organize their growing numbers in one of the French capital’s most beautiful locations, Pont des Arts, in the heart of Paris (a first). Knowing full well that local authorities would never allow such an event to take place there, keeping the location a secret until the very last minute was crucial to the success of the event. Following in his fathers footsteps, one of his sons, Aymeric Pasquier, moved to Montreal and kept the family tradition going when he came together with friends to hold the first Dîner en Blanc in Canada in August of 2009.
unwrap their summer's eve repast. The worldwide phenomenon known as Dîner en Blanc celebrated its 25th anniversary last year! What began as a “friends and word-of-mouth only” event has grown into an international epicurean phenomenon on five continents in 35 cities and 23 countries around the world. While the technology behind the event may have changed over the years, the principles fuelling this fantastic event have not. Diners continue to gather at a secret location for the sole purpose of sharing a high-quality meal with good friends and hundreds of strangers in one of their city’s most beautiful locations. Each event is headed by passionate local organizers who fell in love with the concept and wanted to bring it to their city, giving this rendezvous a local flair. I think it’s just a really cool excuse to get together and forget everything else that’s going on for about four hours, and just really take in that 'joie de vivre' which at the end of the day is the essence of French dining culture. The idea is to show the great power of human connection and share the experience with hundreds of new found friends. As the Twitter posts and newscasts shared the event, perhaps some of the naysayers, who believed only someone "off their rocker" would bring their own tables, chairs and food to dinner and pay for the privilege , were silently wishing they were a part of this. If you're intrigued there is always next year guys. In truth the original cost of buying a table, white plates and a white outfit, and renting chairs can be daunting at first, but once that initial expense is made, subsequent events year after year will cost a minimal amount. Diner en Blanc + the experience = priceless. Over the course of the evening, we savoured appetizers to desserts and celebrated amidst live music, dancing, complete with festive white balloons. Visually breathtaking moments included the waving of our cloth napkins to mark the beginning of the dinner, as well as the lighting of sparklers to let participants know they were now free to circulate, mingle and dance. When it was time to leave, guests pack up their crystal, dinnerware and tables, pick up all their litter and headed into the night, leaving behind no sign of their elegant revelry. It's as if it never happened like Shakespeare's "A Midsummer Nights Dream." Would I attend again next year? Absolutely, year after year! I already have 6 people who have approached me to sponsor them next year. If every member invited one friend to next years event our numbers would double. I wonder if the event is held on the same night around the world? It isn't, but that would be cool. A true food enthusiast I am already dreaming of next years menu which will include even more sponsored friends. To include you in our revelry I offer you a recipe for our appetizer. It is highly portable and requires just a little assembly at your location. Bon appetit!! 'Mangez bien, riez souvent, aimez beaucoup' means (Eat well, laugh often, love abundantly). On a floured surface, roll out the puff pastry 1/8-inch thick. Cut pastry into 5-inch rounds. Place the rounds on a lightly oiled sheet pan. Prick with a fork to prevent them from rising, Place a sheet of parchment paper on top of the pastry and then cover with a second baking sheet. (Note- I always roll the puff pastry dough into a rectangle and prepare as above). Bake for 12 - 15 minutes until brown and crisp. Preheat the broiler. Slip the baking sheet under the broiler 5-inches from the heat source and grill until glazed and warm. Transfer the tart to the centre of a warmed plate. Top with sliced tomatoes and basil chiffonade. Drizzle a line of basil oil around the tart and serve. To make the basil oil, pluck the basil leaves from the stems. Place the stems and leaves into a small saucepan. Add enough peanut or grape seed oil to cover. Heat the oil and basil slowly over low heat, then remove and let stand for 10 minutes. Transfer the contents of the pan into a beaker and puree until smooth with a stem blender. Pour the puree through a fine sieve placed over a bowl, then transfer to a clean bottle. let cool completely and then add olive oil. 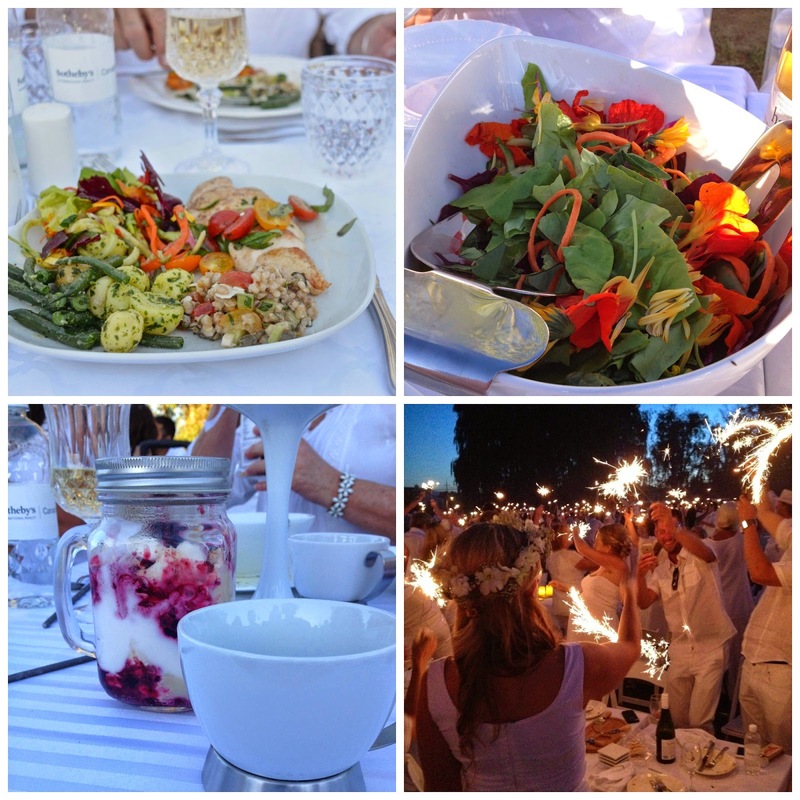 Your dîner en blanc with everyone dressed in white looks like a picture of angels enjoying a beautiful feast. What an experience. The goat cheese and tomato tart must be very tasty, not to mention gorgeous. .
Wow..and the weather cooperated so perfectly. This is such a delightful event! You all look so classy in white. Your galettes must taste wonderful! Wonderful post Val! With the similarities in setting, the moments of sheer magic, and the odd bit of comedy, the comparison to Shakespeare's 'A Midsummer Night's Dream' is a fitting one. And as always, your photos are gorgeous. You've really captured the essence of the evening. Thanks again for inviting me to be your guest. It was such a fun event! It was a "no brainer" to have you as a partner Laura. We "food enthusiasts" need to stick together. I live vicariously through you for these farm to table events. Val, another successful diner en blanc and I don't think I even complained as much this time. So, what's on our menu for next year? I already have some ideas. As Dom says it was utterly glorious. For next year I am sure will come up with something. Such s crowning glory of the season. 'Priceless' is certainly the perfect word to describe this beautiful event, Val! What a tradition and your galettes look scrumptious! I have always wanted to attend one and I learned of this first through you. So now every time I think of this event, I think of you. Looks so fabulous. Thanks for always doing a great post on the event, keeps the excitement going. It seems that I read about one in Knoxville Angela. One day I’d like to attend a Diner en Blanc. Looks like your area did another great job — and I liked the very summery menu you and your tablemates put together. How FUN! I love the idea. It looks like a wonderful evening! It sounds like a wonderful experience, Val. You planned an amazing dining experience with your friends. I remember you sharing this event in the past and I was blown away at how beautiful everything and everyone looked in white. Such an elegant event. 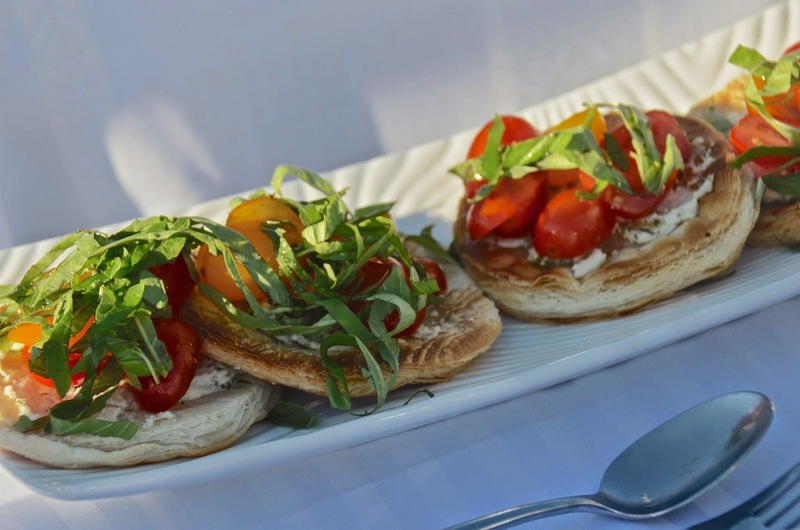 I should try it for our gourmet group :) Your tomato tarts look equally elegant and delicious. Such a gorgeous and delicious event, Val. :-) It's my dream to attend a dinner like this one day. :-) I love your hat. Ethereal is how I imagine the evening to be. Great word. Very perfect location as well. I was so curious as to where it would be held this year and it did not disappoint!